Posted on July 23, 2011 10:23 AM by Lana N.
Posted on July 22, 2011 2:39 PM by Lana N.
Those of you who attended our house meetings heard a message from an Army reservist named Tiffany. (For those of you who did not make it to a meeting, you can listen to the recording here. )Tiffany is a lot like most of us. She's doing everything she is supposed to do, and then some. She's married, has two kids, has worked a long time in the same field, in her case, as an executive administrative assistant. With her fifteen years of experience, she knows how to do her job very well. Unlike most of us, Tiffany's gone above and beyond to serve her country, having signed on twice as an Army reservist and deployed gone overseas multiple times with one long-term deployment. *But Tiffany is still struggling, because she can't find steady work. There are a lot of people looking for a job in her field, and very few people hiring. And her distinction as a reservist, which should be a badge of honor, has turned instead into a black mark on her record. Legally, employers cannot consider her status as a reservist to either deny her a job or to let her go, but after being passed over multiple times, she had to start asking around whether or not this might be a problem. Her fears were confirmed by several friends at companies similar to the ones she had been applying to. (Reservists are experiencing a whopping 14% unemployment rate, well above the 9.2% national rate. )For Tiffany, her own struggle has cast the nation's economic slump into high relief. She's done everything right, yet she's contemplating leaving her own well-paying field after building up years of experience and skills because she can't find work. She has met and read about others in her own situation, and thinking about the ever growing pressure of unemployment and underemployment has spurred her to get involved.TIffany told me that she was incredibly inspired by the house meeting that she hosted last weekend. "The conversations were SO powerful," she said. "We really don't understand how much we all need each other until we talk to one another. "What Tiffany hopes for the future is that Rebuild the Dream keeps growing, that people across the country realize that we really need to make something happen in order to turn things around. She is continually shocked at how little politicians seem to care about how poorly regular people are doing in this country and hopes that politicians and regular people alike will wake up and realize that this is all about something "much bigger than me". *Tiffany wrote to correct me on her deployment. She only deployed overseas once, although she did have to make several shorter trips overseas as part of her service. Posted on July 21, 2011 6:44 PM by Lana N.
Posted on July 20, 2011 6:36 PM by Lana N.
Zombies showed up at TVA headquarters in Chattanooga earlier today to protest the TVA's decision to spend $5 billion more on completion of the Bellefonte nuclear power plant. The TVA halted construction of the Hollywood, Alabama facility in 1988 after sinking $6 billion into the project, which has been labelled as a "nuclear Ford Pinto. "Head organizer Sandy Kurtz said that protestors dressed up as zombies because "it's a zombie reactor. It's neither alive nor dead." He also worried that the TVA was spending an ungodly amount of money on an unsafe power plant with an outdated design, construction permit problems, and a location in a seismic area, when they could be spending the money on cleaner, safer forms of energy that would come online faster and create jobs that would be distributed around the state.The zombies made their way into the headquarters and delivered a petition to the TVA board to kill the power plant once and for all. Posted on July 20, 2011 2:48 PM by Lana N.
Posted on July 19, 2011 6:29 PM by Lana N.
In case anyone was under the impression that our house meetings were only a place for Americans to share their feelings and go home satisfied, think again. Lots of you couldn't even wait for the looming August congressional recess to get started.For example, in Seattle, attendees of one meeting decided that they should go immediately to a congressional office to make their concerns about Washington's obsession with austerity known. Attendees affiliated with Working Washington and MoveOn Council Seattle went to the offices of Senator Patty Murray and Maria Cantwell, met with staff, and requested personal meetings with the senators when they get back to Washington State. 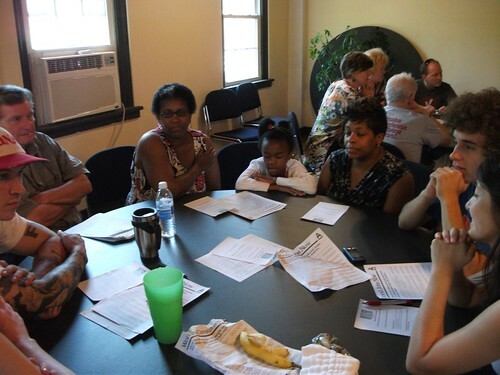 They also have started developing a proposal to take action during the August recess and started networking with local groups like SEIU and Fight for a Fair Economy to see what they could do together. [caption id="attachment_371" align="aligncenter" width="320" caption="House meeting attendees file in to Sen. Patty Murray's office in Seattle."] [/caption]We have lots more examples of similar initiative being shown by groups that formed from house meetings. Let us know what you are up to in your own area! Posted on July 19, 2011 3:26 PM by Lana N.
Paul Ryan Wine Tasting Protest at Racine Office, Tuesday July 19th from Matt Brusky on Vimeo. Posted on July 19, 2011 8:56 AM by Lana N.
Posted on July 18, 2011 3:23 PM by Lana N.
Here's a time lapse video of the collapse of an ice sculpture titled "Morning in America," set to the stirring speech of Sen. Bernie Sanders as he filibustered the extension of the Bush tax cuts on the wealthy. It's both sad and beautiful.Watch it now:Thanks to MaggieRB002 for tweeting us the link! Posted on July 18, 2011 2:39 PM by Lana N.
Over the weekend, over 25,000 of you met in nearly 1600 living rooms across America to share your stories and to discuss the next steps toward taking back the American Dream. You held meetings in every single one of the four hundred thirty-five congressional districts in this country. 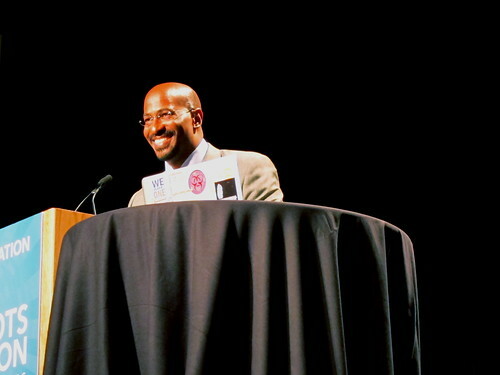 From Missoula, Montana to Midtown Manhattan, from Santa Monica, California to Van Jones' hometown of Jackson, TN, many of you showed up for the very first time to engage in politics.That's huge!By comparison, the Tea Party held only 800 meetings on its first organized day in April 2009. And that was with a full on blast of two months of promotion by Fox News. You organized your meetings strictly through e-mails from our partner organizations, word of mouth, and the good will of all the great hosts out there to open up your homes - no national cable news network necessary.And while the numbers are impressive, that alone wouldn't have been important if you hadn't shown up ready to work on the hard task of reclaiming the American Dream for ALL of us. At the meetings, people introduced themselves, shared what was personally important about the American Dream to them, and then picked which of the top rated 40 ideas in the crowdsourced Contract for the American Dream (you can see for yourself which ideas made the top 40 at the Contract website.) This feedback will be instrumental in deciding which ideas will go into the final draft of the Contract for the American Dream.Looking at the response from the meetings in e-mails and on social media, most people were thrilled to fight back for a change. Many of you were surprised at the number of like-minded individuals who showed up on a beautiful summer weekend. And even given the huge upswell in political participation since 2004, many of you reported that this was your first time to engage in any political activity beyond voting in your entire life.All of this is hugely important. We already know that at a baseline, we're incredibly strong - 150,000 rallied in a single day in Wisconsin, thousands have rallied in the last few months even in places like Utah and Montana. But if we're going to change the conversation from cuts back to jobs, if we're going to stop the corporate takeover of our political process, if we're going to make sure that we have healthy, thriving communities, and if we're going to make sure that those who do well in America do right by America, we need to have as many people as possible involved and on the ground and focused on the task at hand to make it happen.So many of you meeting all over the country was a huge step, but these first Rebuild the Dream house meetings were only just the first of many steps on the way to regaining the American Dream. More to come in the next following days - stay tuned!